This year has been big for apertusº and its AXIOM Beta camera, a new professional digital image capturing platform. The apertusº project focuses on creating open source and open hardware professional digital cinematic motion picture technology. During this year's National Association of Broadcasters convention in Las Vegas, AXIOM began recording at 4K (4096x2160 pixels) resolution for testing. Over the next few months, further development and an eventual release version are planned. The first early betatype shipped on August 25th. The journey of the AXIOM camera began years ago with simple, small devices, and then gained suuport in 2014 with a successful Indiegogo crowdfunding campaign that exceeded its funding goal. A couple months later, a grant from the European Union gave the project the financial momentum it needed to move forward. 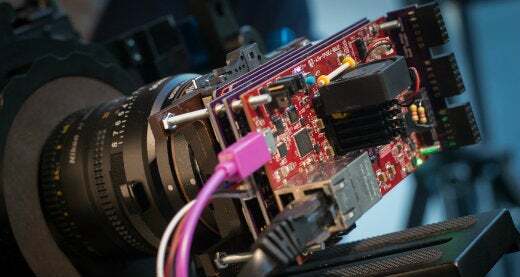 The goal of the AXIOM camera, and the global-community-driven apertus° project, is to create a variety of powerful, affordable, open source licensed and sustainable digital cinema tools. The apertus° project was started by filmmakers who felt limited by the available proprietary tools. AXIOM Beta will provide full and open documentation, the ability to add new features and change the behavior of existing features, and the option to add custom accessories. AXIOM Beta is intended primarily for software and hardware developers. What does the early developer edition look like? Early Beta comes with no enclosure. The image sensor and sensor board design is final. Early Beta comes with Arch Linux, but only test firmware for FPGA—software updates will be delivered frequently online. The lens mount is a passive e-mount with Canon EF or Nikon F mount adapter (both passive). A tripod mount (1/4"-20 thread) is available on the Canon EF/Nikon F lens adapter only. Interface Board is an interim solution with limited capabilities. Only half of the sensor connections are available, which means only half of the maximum bandwidth can be achieved. As a result, the optional 180° rotation of the sensor board is not available yet. The power supply is with 5V DC only—either dual 5V DC (2500mA) or one larger 5V adapter (5000mA). The current power board is an interim solution. Dynamic changing of internal supply voltages is not yet supported, and using a different image sensor module in the future will require manual reconfiguration of the power board. A single HDMI 1080p60 module is available. We might already have a triple HDMI 1080p60 module available when we start taking orders. If not, you can get one at cost later on, or if you are a crowdfunding voucher holder. No HDMI 4K module is available yet. Triple PMOD and LED matrix debug modules are available. Only the Cmosis CMV12000 sensor is currently available, but different image sensor modules will be available later. The camera is controllable only via Ethernet (SSH) or Serial Console (USB). The camera web interface GUI not working yet, but will be fixed with a software update. Screw-on IR/UV cut off filter is required (and we will offer these for purchase). 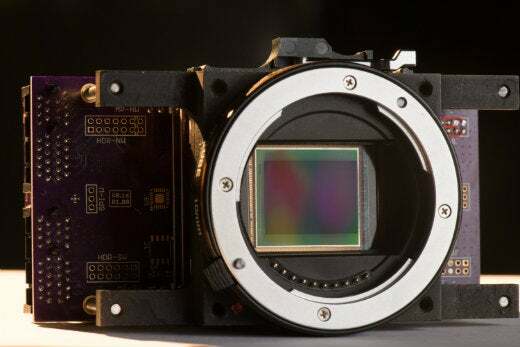 The Beta has no Optical Low Pass Filter (OLPF)—some people consider that a good thing. Swapping out image sensor module for a different type is not plug and play yet; it requires manual reconfiguration of the power board. Early Betas come without color calibration yet, but we want to develop this process together with the community. Current Beta Mainboard is an interim solution and has no configurable data routing to/from shields yet. A new board revision that takes care of this is already finished and will be tested soon. If it works, we will use the new design in the Beta. No add-on shields are available yet. Genlock, Timecode IN/OUT, Trigger, debug, breakout, etc. shields will be available later on. Open Cine is open source software that allows management, playback, and processing of the media captured by the camera. There are several free and open raw-image processing tools for still images, such as: ufraw, darktable, RawTherapee, Rawstudio, and digiKam. Although some of these tools offer batch processing capabilities, none of these tools are necessarily designed for moving pictures. 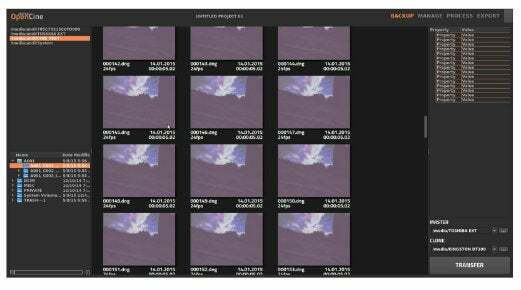 Processing moving pictures, or DNG sequences, is cumbersome and time consuming, so CinemaDNG MXF files are not yet supported by these processing tools. This is why Open Cine, a raw processing tool designed from the ground up for moving images instead of still images, was created. Developers are currently working on a first version. You can see the source code for OpenCine on GitHub, as well as the apertusº Lab and Open Cine workboard, which runs on Phabricator, a series of web-based collaboration tools. mark unneeded clips, rate good clips, and write comments for each clip. Later a filter can be used to hide all the bad/unneeded clips. Open Cine also lets directors review only the desired clips and continue working with them. By building a comprehensive underlying structure, we hope that as Open Cine develops, other users and contributors will collaborate, and perhaps even release plug-ins and updates to make the software even better. The AXIOM Ecosystem was launched to keep the open source community updated on developments and services around the AXIOM cameras. The Ecosystem is open to the general public, which means the community can also use it to share DIY experiments, and to promote professional services and expertise. Visit the Ecosystem to learn more about the AXIOM community, or to create an account and participate. Read my article about open source and its relationship with film and TV production.